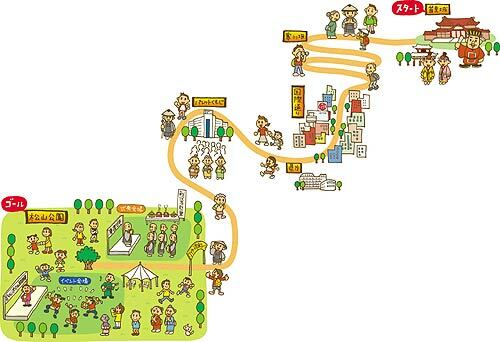 Okinawans will commemorate 400 years of Eisa with “Okinawa Wonder Walk 2004” on Feb. 7. The event also incorporates the ideals of world peace, and all proceeds of the walk will be donated to the Okinawa Peace Prize Committee. The walk from Shuri Castle to Matsuyama Park in Naha City is scheduled to begin at 9 a.m. The Y1,000 participation fee is includes insurance. A memorial service and a stage show featuring various Eisa groups and Okinawan musicians will be held following the walk. Eisa is believed to have been introduced to the Ryukyu Kingdom by a Buddhist monk, Taichu, who arrived at Naha 400 years ago. As many local people found his teachings rather difficult, he is said to have created Eisa in order to make it easier for Ryukyu people to understand his teachings. King Sho-Nei, the ruler of the Ryukyu Kingdom at the time of Taichu’s arrival, was so impressed by Taichu that he built a temple for him at the location of current Matsuyama Park. Those who want to participate can call Yuriko at 098-921-2052 or 090-7294-7509.